Helena has been with The Barking Lot since 2007 she as brought her passion for dogs along with her extentive grooming and training experience. Helena is a third generation dog trainer. She got her first dog at age 10 and has been showing in obedience, agility and conformation since then. 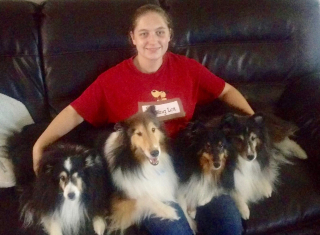 She has put 30 plus titles on her dogs over the years including the earning prestigious Title of Obedience Trial Champion on her sheltie Nova and winningHigh and trail at the National Shetland Sheepdog Specialty. Along with training Helena has worked for breeders training, grooming and giving general pet care. She also worked as a vet assistant before becoming a full time groomer in 2003. She is proficient at all breeds and styles but specializes in herding breeds. Helena and her Husband Jake have four shelties Katrina, Nova, Bounce and Kane.